NES Super Mario Bros. (PRG0) "warps" in 05:08.5 by Michael F.
This is total six timeunits faster than Bisqwit's previous video. This video features really precise timing to cut the times on some levels and two tricks in level 8-4 that most people don't know and some who know still can't do. Uses warps. 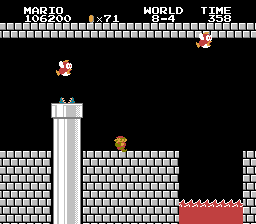 Incidentally, this marks the first SMB movie from an "outside" source (meaning not done by Bisqwit).